Chelsea and Liverpool are flying high as the only two teams left in the Premier League with a 100% record after five games. This Saturday, the Reds host Southampton at Anfield, while the Blues make the short trip to the London Stadium to face West Ham United on Sunday. Both will fancy their chances of making it six from six and maintaining the pressure on Man City, who remain the odds-on title favourites. Dropping down into the second tier of English football and it’s matchday nine in the EFL Championship, with the action getting underway at the DW Stadium on Friday night. After Friday’s game between Wigan Athletic and Bristol City, the other 11 fixtures in the Championship take place on Saturday, with QPR v Norwich the late televised kick-off. Chelsea have swept aside all of their opponents so far to sit top of the Premier League table after five matches. This has surprised many experts, including the club’s own boss, with Maurizio Sarri having stated he thought it would take time to get his ideas across. Liverpool, who also have 15 points from a possible 15, are behind the Blues only on goal difference. At the other end of the table, Huddersfield Town, Newcastle United and Burnley make up the bottom three. It’s looking like being an interesting relegation battle this term, with so many sides struggling to accumulate points. The Premier League actions gets back up and running at Craven Cottage on Saturday afternoon where Fulham and Watford lock horns. These teams are separated by less than 25 miles and whilst this isn’t the fiercest derby around both sets of fans will be desperate to get the right result. After losing for the first time this term last weekend, the Hornets will certainly be hoping to return to winning ways in the capital this Saturday. The Whites probably have the more dire need of a win though and have picked up just one victory from their opening five matches back in the top flight, losing 3-0 at Manchester City last time out. As for Watford, Javier Gracia’s men lost 2-1 at home to Manchester United last Saturday after winning their opening five league and cup matches of the season. Slavisa Jokanovic’s men were hard to beat at the Cottage last term, and we can see the home team holding the Hornets to a score draw on Saturday. Betfair are offering 16/5 for the draw and both teams to score and that’s a big price given both sides are likely to find the net. After losing three games in a row for the first time under Mauricio Pochettino, Tottenham Hotspur will be desperate to put things right this weekend. On Saturday evening in the Premier League, Spurs make the trip to the Amex Stadium to play Chris Hughton’s Brighton & Hove Albion. Neither side is in great form but both will be hoping their opponents’ struggles are greater than their own. After losing back-to-back games in the Premier League to Watford and Liverpool, Spurs crashed to a disappointing UEFA Champions League defeat to Inter Milan last Tuesday, conceding two late goals to lose 2-1 in Italy. Meanwhile, the Seagulls have taken five points from their opening five fixtures in the Premier League to sit 14th. That’s respectable in terms of placing but an average of just one point per game would leave things very tense come spring time. Tottenham will be desperate to dust themselves down and get back to winning ways as soon as possible. The Lilywhites should be too strong for Albion, with BetVictor’s odds of 11/5 for Spurs to win to nil standing out. Pochettino’s men haven’t been playing too badly and against a weaker opponent we fancy they will be able to assert themselves and control the game. 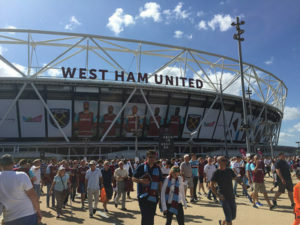 West Ham and Chelsea lock horns in a London derby at the London Stadium on Sunday afternoon. The Blues will be looking to maintain their 100% winning start with a win in east London this weekend but they know they will face a tough test against one of their biggest London rivals from the other side of the city. After four consecutive defeats, Pellegrini secured his first league win as Hammers boss with a 3-1 victory at Everton last Sunday. They were fortunate to win so easily but certainly played better than in previous games and will surely take confidence from their outcome of the clash. Enjoying a very different and far more enjoyable campaign thus far are the Pensioners. Chelsea have won five out of five, beating the likes of Huddersfield Town, Arsenal, Newcastle, Bournemouth and Cardiff City. Eden Hazard is starting to hit top form and he is unquestionably the main man for the visitors. Chelsea will fancy their chances of making it six wins from six at the weekend and we have to agree. Put some money on the away side to win -1, which you can get at the more than fair price of 13/10 with Betfred. The final Premier League fixture of the weekend takes place at the Emirates Stadium on Sunday afternoon. Unai Emery will be on the lookout for his fourth PL win as Gunners boss, while Marco Silva and Everton will be hoping to hit back after losing their unbeaten record at home to West Ham in their last outing. Since losing their opening two, Arsenal have secured three wins on the trot in the Premier League. Meanwhile, last weekend’s 3-1 home reverse against the Hammers was the Toffees’ first defeat of the Silva era. The Toffees will welcome back their Brazilian record signing Richarlison for this clash but injuries at the back mean they may well struggle to contain the Gunners. With Arsenal starting to find some rhythm under Emery, the Londoners should take all three points from this one. It won’t be one way traffic though and Emery clearly has work to do his defence. Take a punt on the home win and both teams to score at 15/8 at bet365. Leeds United are the early pace setters in the Championship, picking up five wins and three draws from eight matches thus far. They are the only unbeaten side in the division but Dean Smith’s Brentford are also flying, with the Bees taking an impressive 15 points from a possible 24. West Bromwich Albion and Middlesbrough have also made strong starts and these four are the sides leading the way in terms of the title betting. In contrast, the likes of Ipswich Town, Preston North End and Reading have been slow out of the blocks and along with Birmingham and Millwall they look the most likely relegation candidates right now. On Friday night in the Championship, Paul Cook’s Wigan entertain Lee Johnson’s Bristol City at the DW Stadium. Only one point separates the Latics and the Robins in the Championship table, with both having made solid starts to their seasons. Wigan, who were last season’s EFL League One champions, have won four, drawn one and lost three of their opening eight matches back in the Championship. As for City, they have won four, drawn two and lost two so far. The pair look pretty evenly matched, and we can see them playing out a draw on Friday. The 1-1 stalemate is available at 11/2 with Coral, with the draw or the draw combined with BTTS other decent options. Steve McClaren’s Queens Park Rangers and Daniel Farke’s Norwich City meet at Loftus Road in the late game in the Championship on Saturday. With this taking place in London, Rangers are the slight favourites with the bookies, despite Norwich being higher up the table. The R’s made a woeful start under McClaren, losing each of their opening four in the Championship. However, they have turned a corner since, earning wins over the likes of Wigan and Bolton Wanderers in recent weeks. Norwich became the first team to beat Tony Pulis’ Middlesbrough this season with a 1-0 victory at Carrow Road last weekend so they too will be in confident mood. This is a tough one to call, but Norwich are capable of pocketing their first away league win of the season on Saturday. The 1-0 Canaries victory is priced at 9/1 with Betfair and that’s a big price in what looks sure to be a tight contest.